A witch's coven in Argentina became a lighthouse of prayer in less than 60 minutes. A prodigal son returned to the Lord in California. An adopted son and the father who had cast him out years before were reunited in Christ. These are real stories of real lives and cities being transformed through the power of prayer evangelism. In this revised and updated edition of a watershed book, bestselling author Ed Silvoso shows that when you change a city's spiritual climate, everything--and everybody--is transformed. It was something the early church knew innately, and here Ed shares a proven, biblical, and practical plan to help you change the spiritual climate of your city. Fulfilling the Great Commission is no longer a distant hope; it is a fast-approaching reality that we may see in our own lifetime. What better time to join the effort? 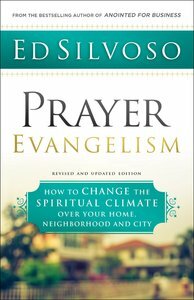 About "Prayer Evangelism: How to Change the Spiritual Climate Over Your Home, Neighborhood and City"